Coaldale Copperheads Junior Hockey team is one win away from clinching first place in the south division of regular season play of the HJHL. Finishing the weekend by taking two wins from two south division teams was huge. It started Friday night on the road when the Copperheads beat Cochrane Generals 5-4 who were currently on a twelve game winning streak. The Generals out shot the Snakes 47-29 but Nolan Berner in net was outstanding which was an advantage. Tyler Anderson, Riese Nevil & Jayden Smith found the openings in the first period. Second period closed off with the Snakes leading 5-2. Brandyn Howg and Linden Gouw placed a couple more goals that period. Snakes played more a defensive style third period allowing the Generals to come within one goal the final minutes of the game. The last three times these two teams played the score was the same at 5-4 and the lone other game went into overtime. If the teams meet during the playoffs it should be one competitive series. Saturday night marked the Copperheads final regular season home plus fan appreciation night. 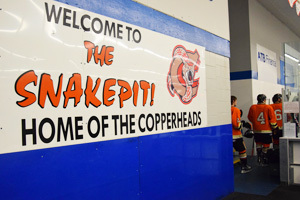 Medicine Hat Cubs came to the Snake Pit and made the Copperheads work hard for their 3-1 victory. First period was scoreless with shots fairly even. Second period the Snakes came out hotter taking twenty-two shots versus the Cubs ten. Copperheads leading point guy to date, Ty Abbott , opened the scoring in the first five minutes of the period. Linden Gouw in the final thirty seconds of the period scored giving the Snakes momentum leading into the third period. Tyler Anderson at 1:11 scored the important third goal of the game. From that point on the Copperheads simply played a smart rest of the period not allowing the Cubs to gain ground. Closing the weekend off the Copperheads are sitting in first with 58 points. Next weekend will be their final regular season game in Ponoka on Saturday. If the Snakes win they will take first place in the south to head into playoffs. If the lose, it will depend on the outcomes of Cochrane and Okotoks final games. Okotoks has one more game to play sitting currently with 57 points. Cochrane with three games to go has 52 points to date. Another season of tight standings for the Heritage south. Playoffs will start following next weekend final games with the first and second place of each divisions receiving a bye. North Division has already been decided with Airdrie in first and Red Deer in second. Stay tuned for Copperheads playoff details once in place including admissions costs as season tickets have expired.